There is a river that forms the border between Georgia and Florida near Jacksonville. It is known as the St Mary's River. The river is 125 miles long. It drains the eastern side of the Okefenokee Swamp. First, it was a story from a professor in wetlands ecology at the University of Florida who, 12 years ago, in response to my comment that I'd like to sample the paddling pleasures of the St Mary's River, told me that he will never again paddle that river, despite its beauty. Why? He was shot at by an unknown assailant while in his canoe. Then, upon proposing a paddle on that river to a friend a few years ago, I was told that the last time he paddled it, his vehicle was completely stripped and ransacked by what was apparently a horde of roving, Florida-style thugs. Finally, after 12 years of waiting for an opportunity to dip my boat into this River of Dread, I get my chance on a three-day weekend. Despite the horrors I've heard of, I'm hot to check out this renowned river after all these years of missed opportunities. The blunder this time is that we should have checked water levels beforehand on the Internet, because the nearly dry river we were about to enter was about to set us on a demanding, treacherous, unforgettable, 9-hour ordeal. A local who saw us unloading our boats at our put-in point chuckled that "you're gonna do some WADING today," in a tone of voice that suggested he knew what he was talking about. He was chuckling because he knew that we didn't. We had no idea of what we were getting ourselves into that afternoon. Our trip starts out along a quite narrow, winding river channel. The water is surprisingly chilly (normally, in Florida, water is 72 degrees year round, which makes it feel like bath water in the winter). The water is also shockingly shallow. But we press on, as we have 12 miles to cover to arrive at our take-out at the Rt 121 bridge, and only 3-4 hours to negotiate the distance before nightfall (we had gotten a late start). "We're only a short distance from where the 'Middle Prong' of the St Mary's joins the 'North Prong/Main Channel' that we start out on," we tell ourselves. Once joined, we presume the river will surely be deeper and wider. The character of the river is as impressive as I had long suspected. 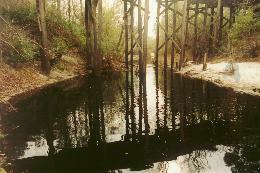 The water is dark chocolate brown in color (a "blackwater" river). The sandbars, sandy bluffs (up to 20 feet high) and sandy river bottom are sugar white. Until we reach the small town of Macclenny near the end of our journey, we see absolutely no signs of civilization. No houses. No cleared areas. No docks. No cars. No streets or bridges. Indeed, for the entire length of our voyage, we see not a single human being on the river in a boat. 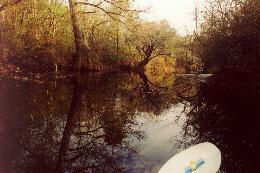 In fact, the St Mary's is one of the most undisturbed, pristine blackwater rivers in Florida. Large, unusual trees line the river, including cypress and tupelo. We are astounded by the size of the trunks and root systems of some of the trees we see. Ordinarily, such a river free of all signs of human activity would be a delightful experience. Ironically, while this is a very rare taste of such an out-of-the-way river, it will also be my first paddle experience in which I actually NEEDED to have human activity nearby (to save us from the peril that we had gotten ourselves into). After 3 hours of paddling, we are surprised to finally come upon the junction with the Middle Prong. We clamber out of our boats to check our map. We make a dreadful discovery. WE ARE NOT EVEN ONE-THIRD OF THE WAY TO THE TAKE-OUT POINT, AND WE HAVE LESS THAN AN HOUR OF DAYLIGHT REMAINING!!! Our prospects suddenly become quite grim. Each of us is wearing shorts, sandals and light shirts. The river-despite being joined by the Middle Prong-remains a trickle. The channel continues to be a fearsome gauntlet of large snags, logs, exposed sandbars and tree branches-many of which force us to portage around or over, requiring us to step repeatedly into the frigid water. Because of this, our speed is averaging a very slow one mile per hour down this River of Doom. Before us is nine miles of unknown. The scene is ugly. Nightfall means that we will no longer have visibility to avoid the obstacles. And the loss of the warming rays of the sun means that if one of us falls into the chilly water-quite likely due to our frequent need to portage and our extremely limited nighttime visibility-there is a very good chance that we'll face the grave danger of hypothermia. Grave because we are in an isolated area that is nowhere near homes or roads which could potentially help us out (by, for example, rushing one of us to a hospital). Indeed, we are so far from civilization that the cell phone that one of us carries is unable to reach emergency phone numbers when we try to use it. At long last, after hours in total darkness, we come upon our first sign of civilization: A home with lights in the windows up at the top of a steep river bank. Dogs start furiously barking at us. The owner comes out to investigate, and is amused to see the hapless paddlers in the dark, empty river below. "HOW FAR TO THE 121 BRIDGE?," I ask hoarsely. "At the pace y'all are goin,' it will take about one and a half hours to get there," he says-a hint of gallows humor in his voice. Later, as I paddle downstream a bit, I ask out loud why I failed to ask him for a ride to our vehicles! "I'm going back to ask," I insist. "No, you're not," a companion says. "Let's press on. Only 90 more minutes of this. We've come this far. A little more won't kill us." We now have no more than 12 inches of visibility in the inky black darkness. The river has become so dangerous with its continuous stream of logs, snags and sandbars that we are forced to paddle "boat nose to boat tail" in a tight cluster of three boats. The lead paddler must continuously shout out warnings for those behind him: "Snag on the right!" "Log on the left!" "Sandbar dead ahead!" We "paddle" for another two hours, and there is no bridge in sight. We come upon a small group of young men camped on a sandbar. One of them shines his light on us. "How far are we from the 121 bridge," I quickly ask (presuming it is just around the bend, and looking to see if they have one of their cars nearby for us to hijack). My heart sinks when one of them says that "y'all are a long way off." He informs us that "it's another two hours" downstream. "20 bends", as he puts it. Another one adds that "you guys have more courage than I do," in reference to the madness of our paddling this River of No Return in the dead of night. And this from someone who had clearly grown up around the river. 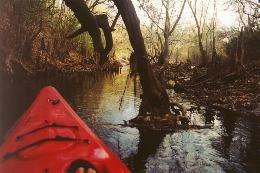 We, on the other hand, were paddling an unknown river we had never before been on. It was a river cloaked in mystery-an unknown exaggerated by the fact that we were blinded by darkness. The terrible, agonizing news from the young men enrages me. For the past two hours, after hearing from our river house friend behind us that we were 90 minutes away, I had been psychologically preparing myself to cope with 90 more minutes of misery. Now, to be told that not only were we NOT near the bridge but were ANOTHER 120 minutes away drove me out of my mind in exasperation. I leave my companions and bolt downstream into the black void, which is a particularly unwise, unsafe thing to do in such situation. For in this sort of condition, there is safety in numbers. Should one of us get into trouble, others could potentially help. Alone, we are nearly helpless. But my rage transforms me into a mindless and reckless madman. Blind because by leaving my two companions behind, I've left behind what little light we had to negotiate the river because one of my companions is carrying a flashlight. I madly thrash ahead as fast as I can. Frequently, I loudly and abruptly crash into tree snags and logs, or beach myself on a hidden sandbar. After four and a half continuous hours of inching along in our trickle of a river full of trees instead of water-completely exhausted from the scratches and paddling through a stream that is more sand than water-I inform my travel companions that I have now lost all shame. Should we come upon a human being, I will readily BEG for a ride to our vehicles. For the first time in my entire life, I was actually DESPERATE to hear the sound of cars on a road-a sure sign that we had reached civilization and a possible way to save ourselves from our worrisome ordeal. For most of our trip, we keep hearing the sound of cars, but they never seem to get closer to us. FINALLY, as I am thoroughly exhausted from 12 miles of nearly futile paddling, I see and hear a car cross my path at the tree line on the horizon. A sure sign of a bridge! A powerful wave of relieved exaltation washes over me. Giddy with glee, I realize that I've survived! At 11:30 p.m., I reach the bridge sandbar. Five hours of jet-black darkness behind me. My companions are 30 minutes before they reach me. We load our boats on the vehicles and head home. I arrive at 2:30 a.m. and drop into bed for an abbreviated night of sleep I am now craving. computer screen: DON'T PADDLE THE ST MARY'S RIVER!!! According to the USGS, in 1998, average flow on the St Mary's was 1,650 cu ft/sec. In each of the years since then up to present, the average annual flow has been about 100 cu ft/sec-more than 16 times less than the flow in 1998. At the sleepy little Town of MaClenny, the gage today is reading 1.5 ft in depth. In other words, the flow is WAY below normal. The mighty St Mary's is barely a trickle.